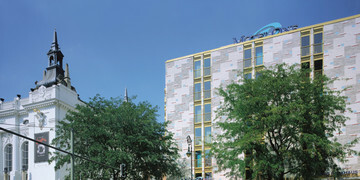 In the very center of Berlin, next to the famous ZOO station, Motel One Berlin-Ku'Damm with 249 rooms was opened in summer 2007. 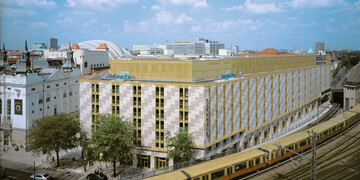 The head of Motel One, Philippe Weyland, made sure that a unique facility would be created in this unique, central location. 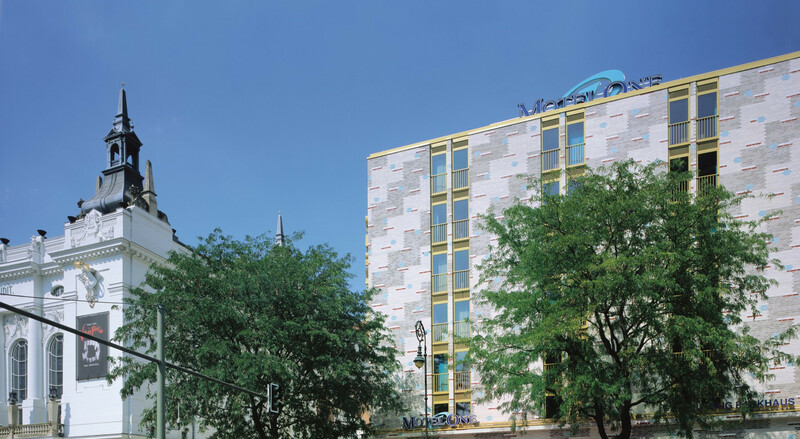 And so it happened – the rich façade of the impressive building has little to do with the idea of low-budget accommodation offered by Motel One. 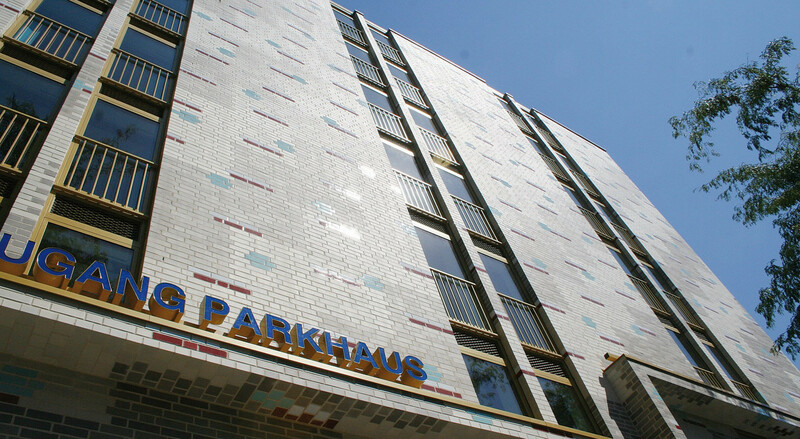 The design was made by the studio of the renowned Berlin architect Benedict Tonon. 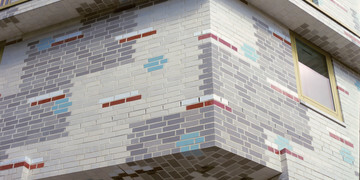 As a result of their work, a very distinctive object was created, with a unique clinker mosaic façade. 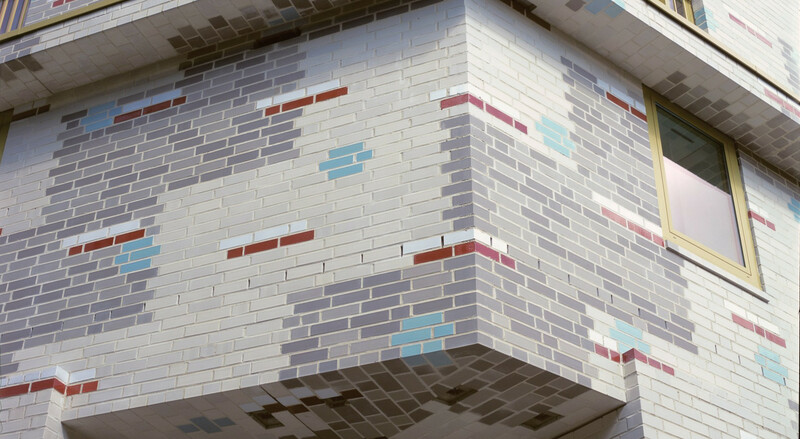 All surfaces of the walls are optically divided by an ordered and rhythmically repeated clinker raster in various shades of gray and colored, glazed bricks. 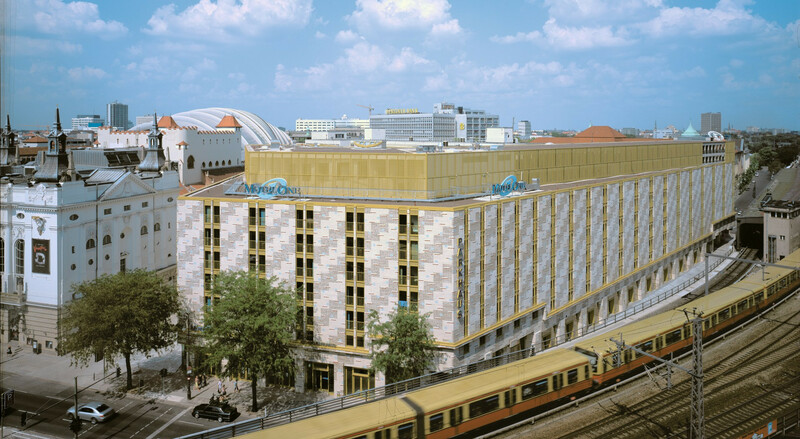 This remarkable building, completed with masterful precision, refers stylistically to the aesthetics of the 1950s, and therefore subtly reminds us of the times when the Ku'Damm district became the new center of West Berlin after the division of the city. 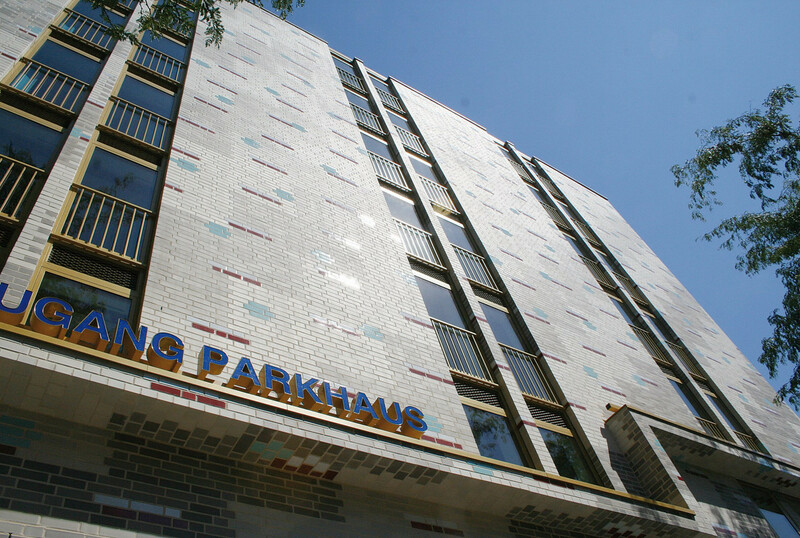 To create a uniform, consistent image of the façade, the clinker curtain wall was used to surround not only the hotel zone, but also a parking garage (the investor of this object is Berliner Parking Partner GmbH). 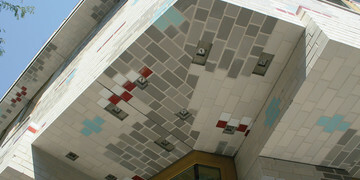 Along the building, the façade is divided into equal fragments through window axes arranged at regular intervals. In this respect, the eastern façade stands out, where you have the impression that the distance between the window axes from right to left are gradually decreasing. This leads to optical elongation of the façade. 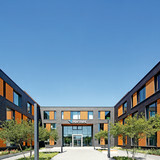 The partner in the creation of this extremely complicated façade was the technical department of the Röben company, which supervised the high-volume production of clinker bricks and ready-made building elements at the Röben plant. 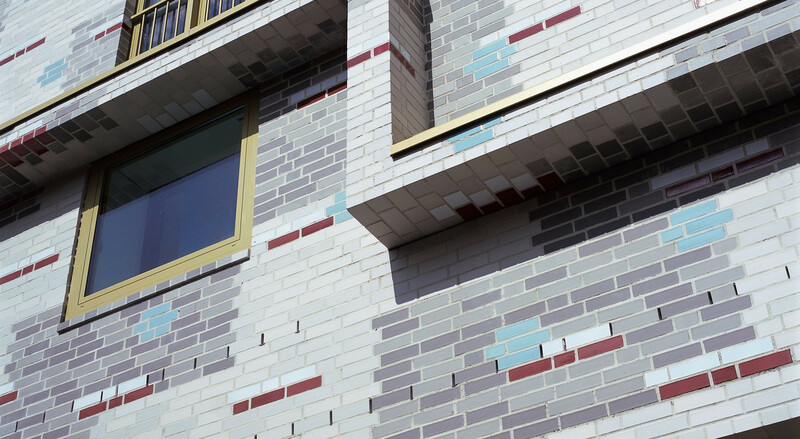 The enormous challenge was to obtain unique colors of bricks: Benedict Tonon chose clinker in 4 shades of gray as a foundation for the façade: luminous, bright, medium and dark. 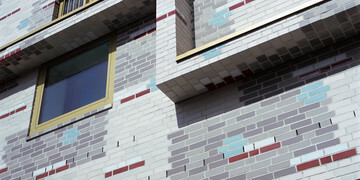 Bricks in these colors were specially made for the design. 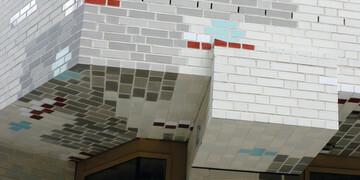 White, red and turquoise glazed clinker was adapted. The latter color had to be in the same shade as turquoise in the Motel One logo. 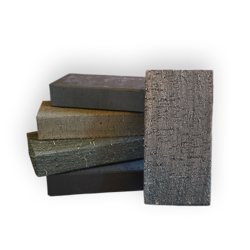 The architects used color codes from the Swedish NaturalColorSystems palette, which were accurately reproduced by Röben ceramicists. 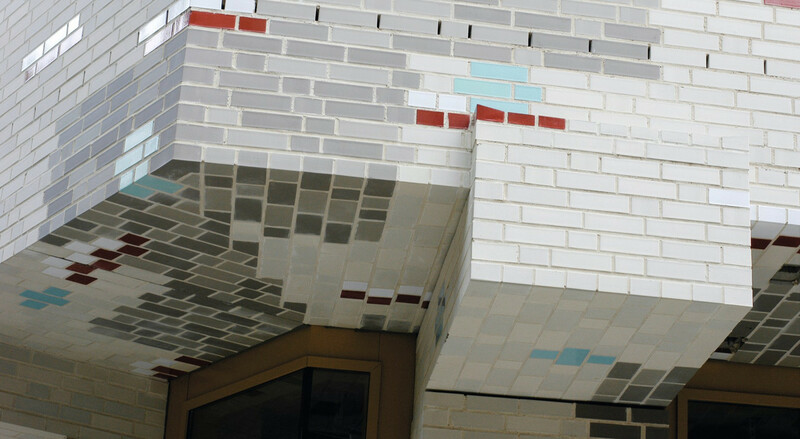 Already at the time of design, to bring out the unusual depth of the structure, the architect proposed a red earthenware as a substrate for glaze. This was an additional challenge for the production, because usually at Röben, the glaze is applied to white earthenware. Another difficulty when making the material for the Motel One façade was the complicated surface in which numerous projections and angles were provided for. 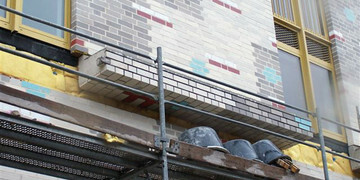 For this reason, the bricks had to be modeled by hand. 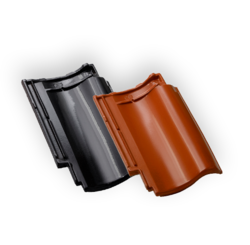 The fittings were burned together with face bricks of the same color. The number of fittings produced in this way ranged between 5 and 500. Many of these fittings were eventually used for the production of ready-made building elements, which were assembled on site with suitable clinker bricks. 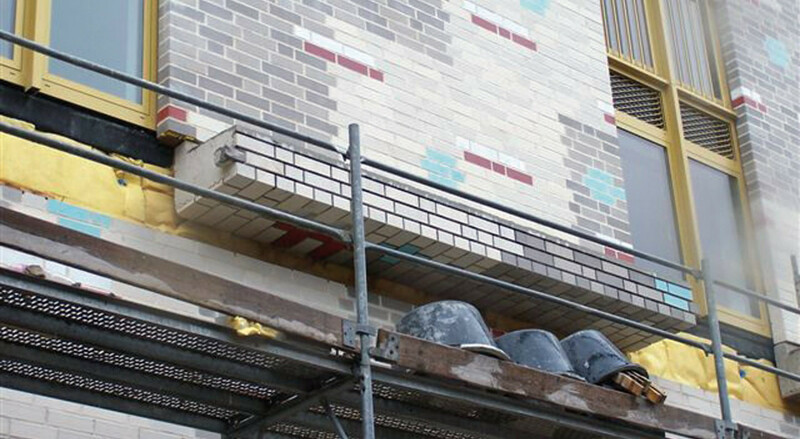 It had a significant impact on the entire construction process – while the production of individual bricks in various colors and their delivery within a certain time is not a problem, here we had to synchronize the whole process with numerous ready elements. The real challenge for the main contractor, construction company Hermann Kirchner, was not so much the work of masons, but rather logistics on the construction site – starting from the arrangements related to detailed assembly plans, to precise timely coordination of production and delivery of fittings and ready-made components. Owing to the excellent cooperation between the architectural studio and construction companies, as well as the technical and production department of the Röben company, it was possible to complete all construction stages without any obstacles. In order for the right bricks and ready-made building elements to be delivered at the right time and put into the right place, all the bricks were precisely numbered at the factory, while ready-made building elements, which were produced in small quantities, were packed individually into small pallets. 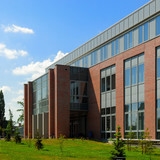 The building structure was made of reinforced concrete. 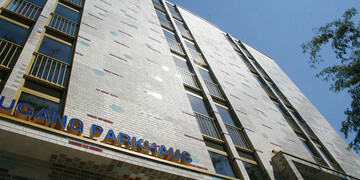 When the raw building was almost ready (including the embedded windows), it was time to start works on the façade, entirely made of brick on consoles. Ready-made elements were assembled at the very end. An interesting detail here are the cornices delivered as ready-made building elements in three layers, which perfectly blend in with the façade. 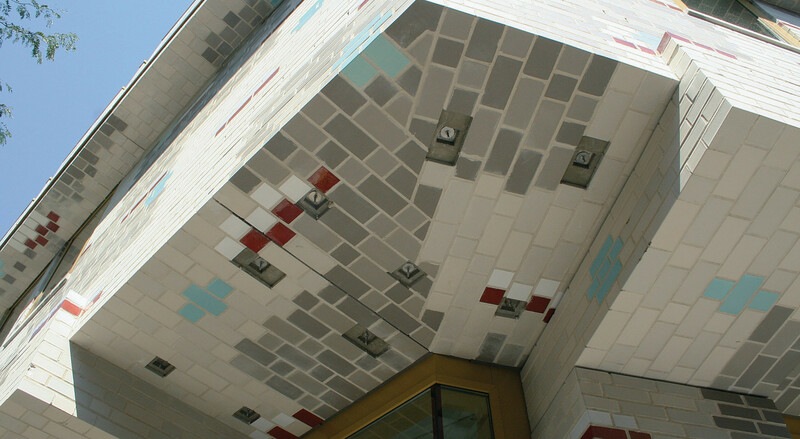 To make all the surfaces of the façade in accordance with the design assumptions, the masons received detailed drawings with the dimensions of the layers and the location of each brick. They had to copy that pattern and somewhat put it on the façade. These activities were repeated at each fragment of the façade. 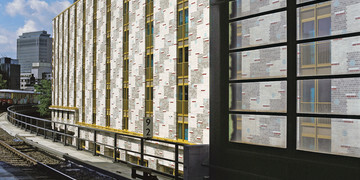 Similarly, the employees in the ready-made construction elements plant used precise production drawings of the technical department, on which each brick was shown separately. The clinker was laid in the formwork in accordance with the guidelines, like a puzzle. 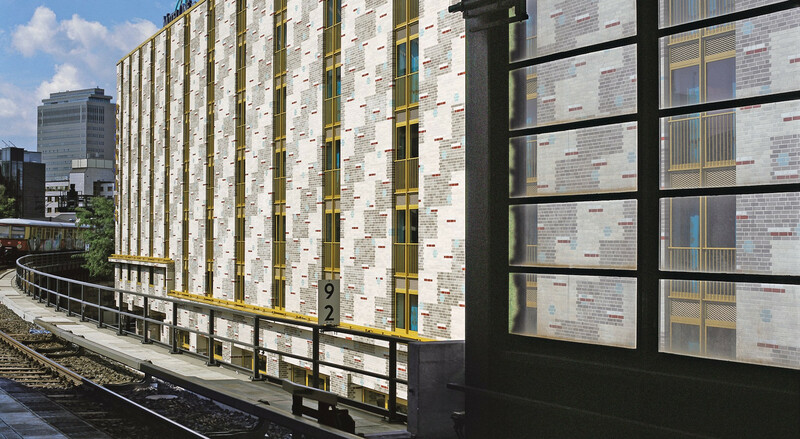 In this way, a total of 250 various ready-made building elements for this facility were prepared, including cornices, window sills, wall and column covers, as well as huge, prefabricated, ceiling slabs with three visible face surfaces, which were laid under concrete ceilings. Despite big challenges on the construction site, the hotel was completed in line with the schedule, in a short time. Guests are pleased with this solution because they can enjoy the perfect location of the new Motel One and admire its sophisticated, mosaic façade. The Röben technical department has been developing special solutions for various designs for over 20 years. 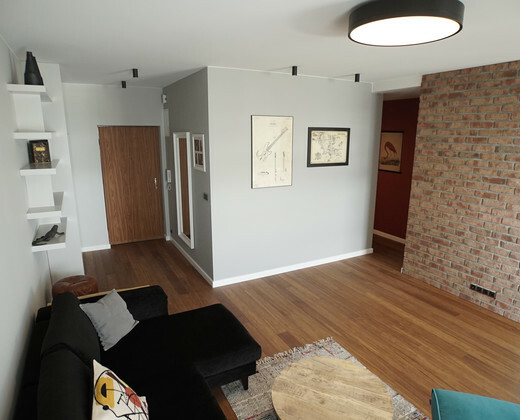 The team consists of construction engineers and people who previously worked as masonry masters and creators of basic designs. Craft experience, engineering knowledge and creativity of the team makes it possible to implement any, even the most complex and original idea of the architect. 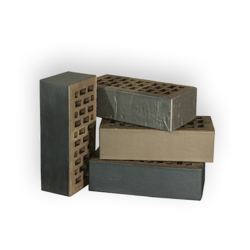 After consultations with designers, we create ready-made ceramic building elements, burn bricks specifically for the needs of a given object, bricks for architects, special glazes and shapes. 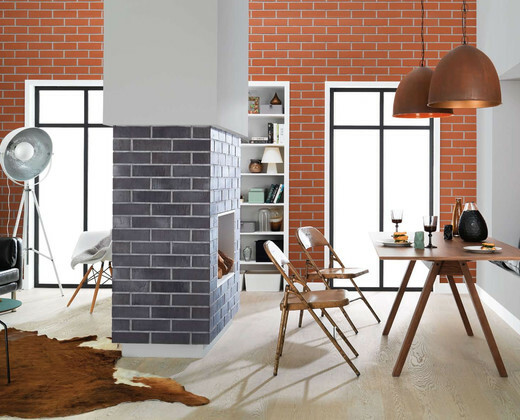 The Röben technical department opens up completely new dimensions of creative and structural possibilities, answers all questions regarding wall bricklaying, helps with tenders, constructs and calculates building elements according to the architects' wishes. In addition, it takes over logistics and oversees the construction until the final phase.